Made with 100% olive-derived squalane, this weightless facial oil hydrates the skin without clogging pores or leaving behind a heavy, greasy finish. 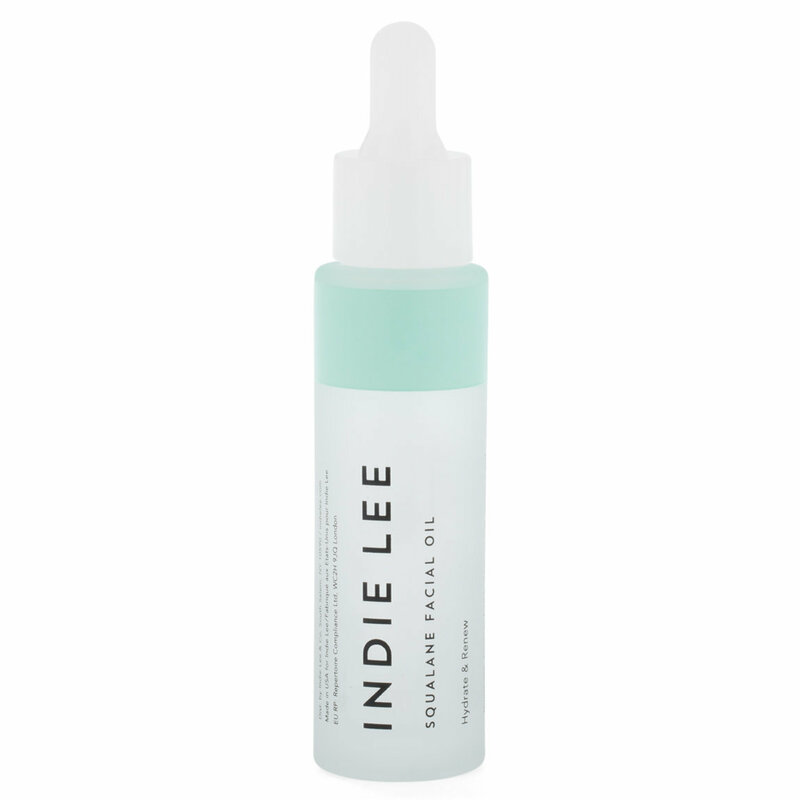 Ideal for all skin types, Indie Lee Squalane Facial Oil quickly absorbs into the skin to moisturize while improving the appearance of texture, tone, and elasticity. Apply a few drops to freshly cleansed skin in the morning and at night. Excellent for face, hands, neck, and décolleté. Before all else is said, it's important to know a couple of things about the way facial oils work: by creating a light barrier to help keep moisture in the skin and also acting as an occlusive agent for serums and creams locking everything in and, many think, helping these lotions and potions act a bit more effectively. So if an oil is applied first, nothing applied on top of it will effectively reach the epidermis. Given these properties, facial oils should be applied as the very last step in any skincare regimen; especially when SPF is involved. 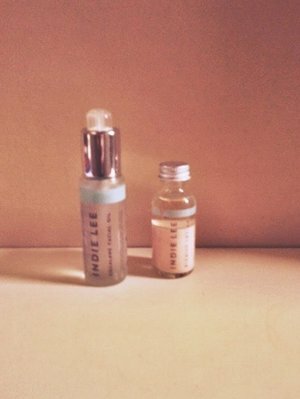 Now, about this particular product, after reading about Indie Lee's journey and being in dire need of a new facial oil, I decided to give Squalene Facial Oil a try and I am really impressed! It is ridiculously hydrating, has no smell and absorbs quickly, making it a breeze to use before makeup, as the FINAL step before primer/foundation. However the pump dispenses way too much product; a dropper would be a much better choice. I received a sample of this non-comedogenic oil in with my most recent order. I ordered a few other things from Indie Lee, but was unsure of exactly what to buy since everything looked so interesting. The sample I got came in a little glass bottle with a medicine dropper dispenser. I’ve been applying this in the morning after cleansing. I just put a few drops in between my fingers to warm it up, and then press into my still damp skin. I usually follow with a moisturizing sunscreen. I’m a big fan of face oils, and have used Tarte Maracuja oil & argan oil. This one feels lighter than both of those. My skin doesn’t feel greasy at all after it absorbs. I have to use it for a little bit longer to see if it actually diminishes the age spots around my eyes, but so far I really like the way my skin feels. I am always hesitant to switch up my skin care too much because I am prone to breakouts. However, I am happy to report that this product did not cause me any irritation at all, and leaves my skin feeling light and fresh. I am currently using this in the morning and the Indie Lee Lavender Facial oil at night after cleansing and applying the Indie Lee CoQ-10 Toner. I have to say, I really do see a difference in my skin! Perfect for my combination skin. Do you just feel inundated with oils lately? It's everywhere you look. Sheepishly, if you were to look in my bathroom cabinet you would find almost 10. Just for the face. I have fallen in love with Indie's Squalane Oil. I had to do a little research first and was impressed with her sourcing. On the face, it disappears quickly. There is nothing left behind to bind with your primer and make a big mess of your foundation. It hydrates beautifully! I mix it in with my moisturizers and love the results. Also I want to mention that my hands are getting that awful crepe-y dryness that no lotion can seem to penetrate. This oil is the only product I have ever found that takes it away. I was amazed. Won't be without it now. It was through my work with Maxine Tatlonghari of Vanity Girl Hollywood and my fellow make-up artist, Olivia Danielle of ODMakeup that I came to learn of Indie Lee's All Natural Beauty Products--my colleagues absolutely adore Indie, her line, and urged me to experience its majesty for myself. Well what can I say--my girls are total beauty junkies who certainly know how to spot rare gems and share the love ;) I've been using this 100% olive derived Squalane Oil religiously, day and night, as my moisturizer and it truly is magic in a bottle! This colorless, virtually odorless oil absorbs deep into the skin helping to retain moisture while smoothing the skin's surface without feeling sticky or looking greasy. It creates the perfect canvas for makeup application--any products applied next simply glide on like buttah! It's also highly concentrated so only about 3 drops are needed when applying and patting it onto the skin. Naturally, I have combination skin and in the first three days of using this product, my t-zone appeared slightly more shiny than usual--however, after that period passed, I noticed my skin come into a complete state of balance and begin to feel more supple! Since using this Squalane facial oil, I've experienced far less oiliness--let me say, I've never before had any other skincare product perform in such a way and leave my skin looking so radiant--I am in LOVE! You guys I'm always searching for products to keep my face hydrated. This is it. The first thing that this Squalane Oil does is takes the dull layers off (in conjunction with prior exfoliation). After a week, your skin is more even toned and glow-y! I get so many compliments. I think that dewy skin is attractive. Who wants that matte look when the are make-up free? Not me. It's not oily at all. I like the oily/glow look, so I use six droplets. Don't touch the dropper either! For a moisturized look, use just three droplets. Ethnic skins loves oil, grease, sheen, etc. since the dawn of time..we just flat out love that moisturized look. All races have caught on now, and this is one of the holy grails for your face. I'll forever use this. I believe that all skin types and shades and genders should use oils on their faces for anti-aging and upkeep properties. We all deserve that! Enjoy. I am! I'm a Makeup Artist, and my knowledge of skin care is somewhat limited. That being said, I must say that I LOVE this product. I'm used to facial oils that are very thick and somewhat tacky to the touch. The Squalane Facial Oil is fairly unique in the sense that it really absorbs into the skin quite quickly, and it makes your skin feels silky smooth almost immediately. I've been using it for a week now, and I can definitely see a change in my skin's overall appearence. My skin looks more refreshed and refined. I do have some areas of discoloration on my face, and this product has really really lightened up these areas, and I couldn't be more thrilled with the results. If you are like me, and have purchased most every product known to lighten discoloration, do yourself a favor and stop and purchase this oil. It will produce results very very quickly, and it is now a part of my staple skin care regimen. Trust me, you won't be disappointed. It is my new staple in my skincare regime. I know that oil is best for oily skin - it penetrates easier. Think about it - water and oil do not mix so water based moisturizers designed for oily skin tend to sit on the surface of my face. Not this. 3 drops and done. I wash my face with The Cleanser and follow with Shea Terra Organics Orange Water Toner. I love this bottle it's - so scientific! No need to shake, I unscrew the dropper cap and add 3 drops of oil to my finger tips. I press my left and right fingers together to spread the product and then press it into my face. That's right, I press it. No rubbing. The first time I used it I thought I needed more. I was so used to the feeling of my old moisturizer that I didn't realize what I was now feeling was perfectly moisturized skin. No tightness. No grease. Just gorgeous naturally moisturized skin. Derived from olives, this naturally occurring oil promotes elasticity in the skin and as we age, its production diminishes. By adding this key component, our sebum helps boost cell regeneration and oxygenation, leaving your face looking healthy and radiant. Naturally not greenwashed. My skin is not breaking out nor am I experiencing as much congestion or blackheads as I was prior to switching to this oil. My skin is clear and fresh. I am NEVER greasy or oily and about 2 weeks after I started to use it I noticed I was actually less oily. My makeup not only looks fresh longer through out the day, I have less touchups. Or as I used to call them, mop-ups as I was usually blotting excess sebum off of my face. And for the first time in my life, I have been able to buy powder and foundation that are the same shade as my skin. I used to have to buy 1 to 2 shade lighter as my oil oxidizes everything 1 to 2 shades darker than my actual skin tone. This 1oz glass bottle retails for $24 on BeautyArmy. It will most likely last me 6 months because I use such a small amount. Keep this oil stored in a cool dry place - try not to store it in your hot bathroom. The brown glass of the vessel protects the damaging rays of the sun breaking down the product, keeping it's potency and freshness as long as possible. I love this stuff to pieces. It makes my skin feel soo smooth and soft. It make my scaring diminish. I do not know what I did before this oil. It is truly amazing. It leaves the skin feeling new and flawless. Super smooth. It's amazing. A little bit goes a long way! I got a free sample of this when I first placed an order, and I was very skeptical. Other face oils I've used leave my skin super oily and didn't hydrate my skin. However when I first used it, it felt so good. It was not oily at all-I know a facial oil that's not oil, how can that be right? Well it's true, it! After about a week, I noticed my skin looked a lot healthier. I really love this product. My skin is combination, I have some oily patches and some dry patches and this product has just taken care of it very nicely. It was great for my sensitive skin too. It has improved my skin so much that I can put some on in the morning and walk out the door without any makeup! Really an amazing product, I'm just so sad I didn't discover it earlier! The holy grail of facial oils! Absorbs super quick and my face is left velvety smooth. This will last forever as you only need a couple of drops. Great product, great price!